The D5 Series μHeat Accessory is a real time alternating magnetic field application accessory for different types of optical microscopes. It enables magnetic heating procedures during optical microscopy observation, providing revealing data, images and movies from a thermally and magnetically controlled device. This accessory is designed to work using any D5 Series Driver. μHeat has been specially designed to be compatible with three different models of optical microscopes depending on the location of the objective and the lamp: direct, inverted and reflected. Within these three types of optical microscopes, each μHeat is customized according to each specific model studying other parameters such as materials, objectives, stage, etc., so in case of being interested in this accessory, tell us your microscope model. μHeat is made up of a coil, which generates the magnetic field of interest, a capacitor to set the frequency and a holder to allocate cell culture dishes. This accessory also contains an internal chamber for gas mix flow and allows adding a secondary chamber for thermalization water bath as an additional option. Image 2. 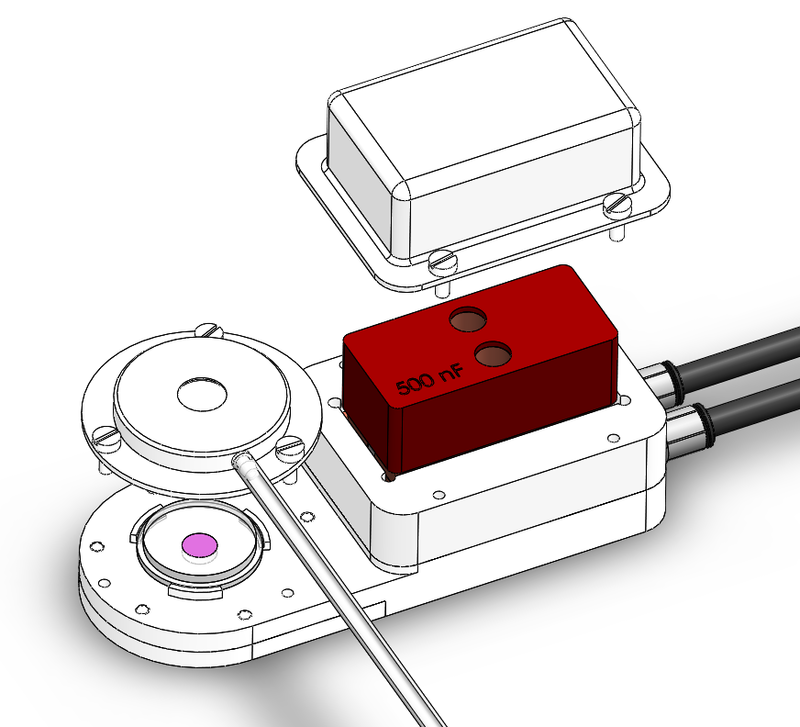 Design of uHeat for direct microscope with gas mix chamber. The position of the coil is fixed and so is the distance to the sample so this results in a very accurate magnetic field to provide repeatable results. Calibration certificate with field map distribution is included. The Driver supplies the electrical current and the water circuit to refrigerate the accessory. Both coil and capacitor are protected to avoid electrical risk. D5 Series allows the user to perform trials at different frequencies (depending on the capacitor) and field values, to record and monitor sensors, and to analyse and store results. Any D5 Series setup can perform MnH trials with Heat Accessory in many configurations with different microscopes and petri dishes. INTERESTED IN MAGNETIC HEATING DURING OPTICAL MICROSCOPY?